The BBC has reported that the acroliths in the University of Virginia Art Museum in Charlottesville will be returned to Sicily in February 2008 ("Looted sculptures to be sent home", BBC, January 4, 2008). They are reported to have been looted from Aidone (Morgantina). The repatriation of the sculptures is especially appropriate and important as they can be put back in their original historical, cultural and religious context. While it is true that they will be displayed in an appropriate setting, the physical context and the precise relationships between these acroliths and other items has been lost. What is not known is how the statues made their way from Sicily to Virginia. It is thought that they made their way via the black market of looted antiquities to Switzerland before surfacing in London in 1980. Reports say they were eventually handed to the University of Virginia's art museum by a New York philanthropist. 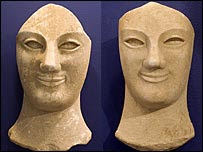 The Viriginia sculptures are reported to have been looted from Morgantina in the 1970s (and said to have been seen in the boot of a car in 1979). They then surfaced in the hands of Robin Symes who sold them (in 1980) to Maurice Tempelsman (for a reported US$1 million). The timing of this return coincides with the display of ex-Tempelsman items in a Rome exhibition which marks the return of antiquities from various North American collections. See also Brian McNeill, "UVa to return looted Greek statues", Dailyprogress.com, January 4, 2008.